Ten suspected mail bombs in total have been addressed to high-profile Democrats and supporters in New York, Delaware and Washington, D.C. Packages addressed to Hillary Clinton, former President Obama, billionaire George Soros, ex-Attorney General Eric Holder, former CIA director John Brennan, Rep. Maxine Waters - who was sent two -- Joe Biden and Robert de Niro all appear to have the same characteristics. NBC has team coverage. Investigators seized three more suspected package explosives -- two addressed to former Vice President Joe Biden in Delaware and one addressed to Robert De Niro in New York -- early Thursday, bringing the total number of confiscated devices sent to high-profile Democrats and others to 10 in 72 hours. Multiple officials briefed on the investigation say there are no solid leads on a suspect as of Thursday afternoon. While there are no known devices still outstanding, they remain concerned there could be others still undiscovered. Officials say they are looking into whether at least some of the packages were mailed from Florida. They also say the devices were poorly made and it is unclear if these were attempted hoaxes or simply a case of bad construction. Ten have been seized in total since Monday, though most of the intercepts came Wednesday. Three more -- to Biden and De Niro -- came Thursday. News of the De Niro device broke first. That one was addressed to him and had been sent to a Greenwich Street building he owns that houses offices for Tribeca Films and Tribeca Grill. A building worker called police early Thursday because, after seeing Wednesday's news, he remembered seeing a similar package a day or so earlier. The device was safely removed from the property. Less than two hours later, the FBI and local police swarmed a postal facility in Delaware in connection with the bombing investigation. Sources had said authorities suspected a similar device may have been addressed to Biden. Nothing was found at his house, but investigators apparently tracked it down in a New Castle postal facility, officials said. It was said to be akin to the others. About an hour later, a second package addressed to Biden was confiscated at a postal facility in Wilmington, Delaware. Details on that one weren't clear. 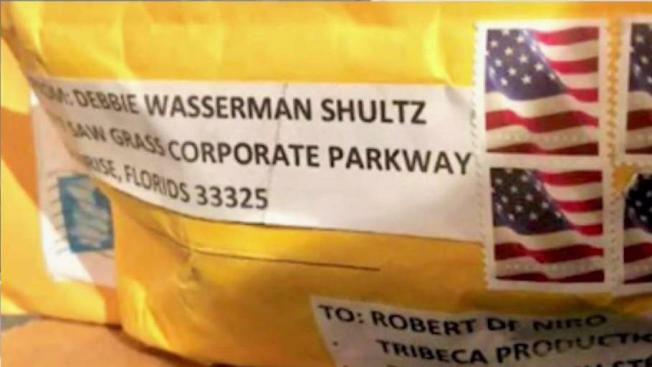 The De Niro device and at least the first Biden package had the same stamps and return address (that of Florida congresswoman and ex-Democratic National Committee chairman Debbie Wasserman Schultz) as others reported on Wednesday. Two senior law enforcement officials say they are looking into whether some of the packages were mailed from Florida. They are also looking into any past incidents involving Wasserman Schultz's office and if any of those incidents could be connected to these devices. As of early Thursday, there have been 10 such packages. In addition to Biden and De Niro, two devices in separate packages were addressed to Rep. Maxine Waters of California; ones were also addressed to Hillary Clinton, former President Obama, ex-Attorney General Eric Holder and former CIA director John Brennan. The first in the series was a mailbox pipe bomb left at the Westchester County home of billionaire philanthropist George Soros. None of the devices detonated and no one has been hurt. Authorities are examining the crude explosives and warning there could be more out there. NBC News obtained an X-ray photo of one of the bombs, which shows protruding wires that appeared to be connected to a cylindrical device. Meanwhile, investigators examining the explosive devices are working to glean forensic clues to help identify who sent them, gathering fingerprints and DNA evidence while tracking the origin of the packages and the components used. While some have made note of the fact that the devices were not postmarked, multiple officials have said this was not uncommon, and that because of the soft packaging they could not go through automated sorting machines to have their postage canceled. Former NYPD Commissioner Bill Bratton said on MSNBC Thursday that it's a plus the FBI has recovered so many of the package bombs. They will look into whether they were intended to function, how they were supposed to detonate and where the design came from. That could help find an online trail. Larry Johnson, a former head of criminal investigations for the U.S. Secret Service who also served as a special agent in charge of the presidential protective detail, said it is highly likely that the person or people who built the bombs have been previously flagged by law enforcement. The reaction to the devices was swift and visceral, with high-level people on both sides of the aisle, including the president, pledging Wednesday no resources would be spared in taking down whoever was responsible. The tone became more partisan-charged over the course of the day, with some assailing the White House for its "violent political rhetoric." Upon news three more packages, including two addressed to Biden, were seized early Thursday, Brennan, who was the addressee on the CNN package, tweeted at Trump to "Look in the mirror" and "Clean up your act." "Stop blaming others," Brennan tweeted. "Your inflammatory rhetoric, insults, lies & encouragement of physical violence are disgraceful." The president responded shortly thereafter, slamming "Fake News" as "a very big part of the Anger we see today in our society." "Mainstream Media must clean up its act, FAST," Trump added.